Utforska Millennium Cross och Matka Canyon på denna halvdagstur från Skopje. Resa från den historiska Skopje fästningen till Vodno Mountain med en guide, ta sedan linbanan till Millennium Cross - allmänt betraktad bland Skopje toppattraktioner. Utforska byn Gorno Nerezi och beundra vackra bysantinska fresker i kyrkan St Panteleimon. Hoppa djupt in i Matka Canyon - hem till gamla grottor och medeltida kloster - sedan resa i bekvämlighet till Porta Makedonien. Fantastic experience, especially the Matka canyon. The view to and in the cave was breathtaking. The guide was good and friendly. I will recommend that viator should be more specific with regards to the start time of the half day tour. My wife and I took the half-day tour at the end of March and very much enjoyed it. Our tour guide Michal was excellent and gave us plenty of information about the places we saw. We particularly enjoyed going up Vodno and seeing the views of Skopje and the snow-capped mountains in the distance. We felt the tour was a little rushed with only 20 mins on Vodno and 1 hour in Matka Canyon. However, it's a half-day tour so I guess we couldn't have expected much different. Overall, we'd recommend this tour as we did have a good time. I went on this tour with a tour guide who spoke very good English and his knowledge of the area was impressive and very interesting. He explained everything very well and I enjoyed the trip very much. Definitely a highlight of my trip to Skopje. Thank you very much! It was very nice, I would definitely recommend it. Great tour. Friendly and knowledgeable guide Martin and driver Orhan. Flexible and accommodating to the customers interest and preference. Opportunity to hire a canoe and paddle Matka Canyon. The sights in itself weren't bad, and they're musts when in Skopje. Except maybe from the church, which seemed like a filler. But the Matka valley is so beautiful, as is the view from Vodno. However, our guide was pretty much phoning it in, seeming like he'd rather be anywhere else in the world. He was accommodating and informative when I asked about the sights, however he didn't do anything to build a relaxing atmosphere, so it was hard to break the ice and connect with the other visitors. If you're going with others and don't mind spending a few extra bucks so you don't have to arrange going by public transportation, this trip might be worth it. But in retrospect I'd have preferred hooking up with other travelers at the free walking tour and simply splitting a taxi. Excellent half day out. Stunning view of Skopje from the Millennium Cross, and beautiful, dramatic scenery through the Matka Canyon. The boat ride through the canyon was a pleasure, and very relaxing! Definitely a tour worth the money! It's a shared tour, so if you are a solo-traveller, or duo/trio travellers, this is a good option to go on a tour that is also affordable, when you aren't a big group of people. The tour starts at 13:00 and ends around 17:30-18:00. The first part of the tour takes you to the beautiful Matka Canyon, where you have an hour of doing what you want e.g. swimming, canoeing, trekking or sailing in a boat. I did the latter option and we visited a big cave. Afterwards we drove to a mountain church and stopped for a bit, followed by the last stop of the day the Millennium Cross situated high above Skopje. We reached it with cable car and the view was astounding. The tour guide was really nice, knowledgable and good at answering additional questions. I can definitely recommend this tour! 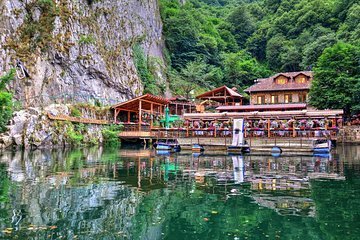 A great little tour to get the know the surroundings of Skopje, the highlights being the visit to the Monastery of St. Panteleimon with beautiful fresco paintings, and above all a boat ride in Matka Canyon, which is just stunning. Our guide Martin was super friendly and knowledgeable and was able to give us good insight into how things are in Macedonia in general. Would recommend this to everyone. Excellent tour with friendly and knowledgeable host! The scenery and views were breathtakingly beautiful.